Homemade bread is one of Life’s Great Simple Pleasures. Made in a bread machine or the product of loving hands, homemade bread nurtures the body and the soul. The trick to making bread is not being intimidated by your “less than best efforts”. Bread making is an art and it does take practice to hone the skill, but the results are almost always tasty if not perfect. I’ll start by offering some great recipes for the beginner. 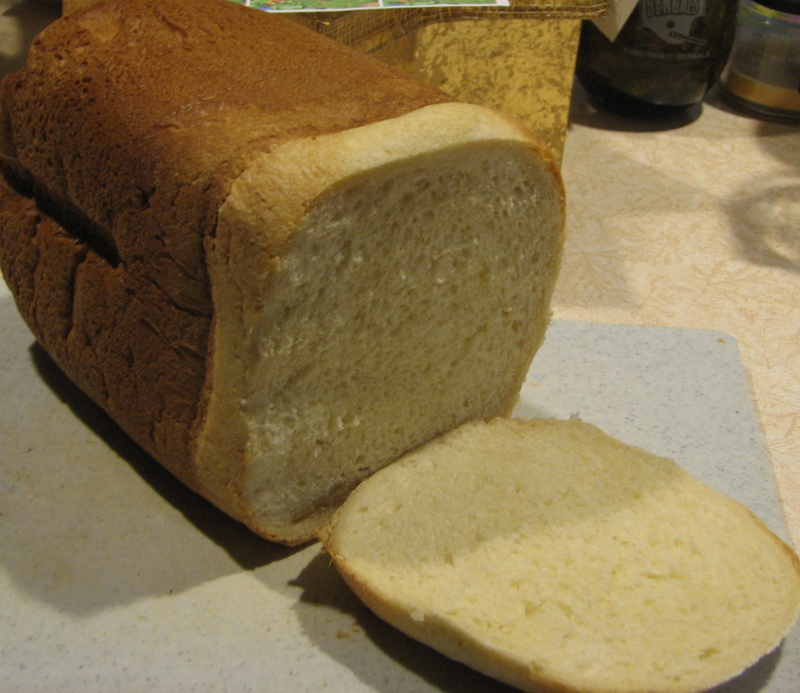 A bread machine makes wonderful bread with very little effort and is almost fail-safe. Having said that, I have had my share of failures… Usually because I was not precise enough measuring the ingredients. My failures usually get eaten by my family and if they turn up their nose, the birds are always appreciative! My favorite bread machine recipe book, given to me by my sister, is titled Bread Machine Magic by Rehberg & Conway. One of the best recipes is for Egg Bread. When my chickens are in good egg laying form I make this bread as often as every day. Place all ingredients in bread pan in order listed, select Light crust setting, and press start. Cool before slicing. 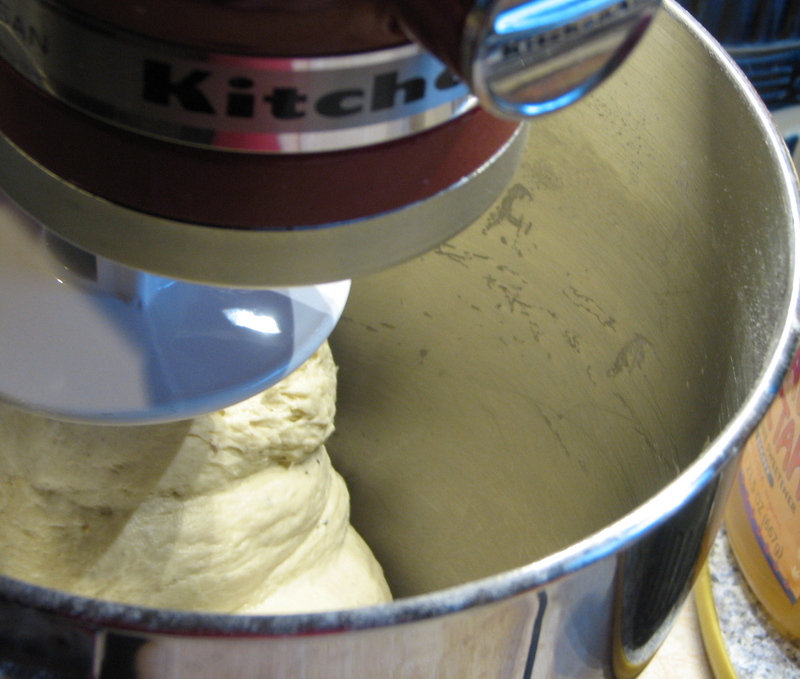 My kitchen-aid mixer offers another method of bread making that is pretty easy. Mix the dough with the bread hook until it pulls away from the sides of the bowl and leaves the sides clean. Take the dough out to rest on the counter while you wash the bowl, dry, and spray with nonstick oil such as canola. Return the dough to the bowl and cover with plastic wrap or a clean kitchen towel. Let dough double, knead down and shape. You can use a muffin tin, a 13 x 9 oblong cake pan, cookie sheets, or several 8″ round cake pans. Let the rolls rise until doubled and then bake in a preheated oven. In a large mixing bowl, dissolve yeast in warm water; let stand for 5 minutes. Add shortening, eggs, sugar, salt and whole wheat flour; beat until smooth. Add enough all-purpose flour to form a soft dough. Use the hook to knead the dough until it pulls away from the sides of the bowl cleanly. This usually takes only a few minutes. Remove hook, let dough rest on counter, clean bowl, spray with oil and return dough to bowl to rise until doubled. When doubled, massage down and divide into four portions; shape each into 12 balls. Place 1 inch apart in greased baking sheets or pans. Cover and let rise till doubled again, about 25 minutes. Bake at 375 degrees for 11-15 minutes or until browned. Brush with melted butter. Field: 4 dozen. Next week I will post a few of my favorite bread recipes that I mix by hand. I will offer encouragement and advise to walk you through the process so that you will be successful. This entry was posted in Recipe and tagged bread recipes. Bookmark the permalink.